Mick Fanning keeps world championship dream alive. 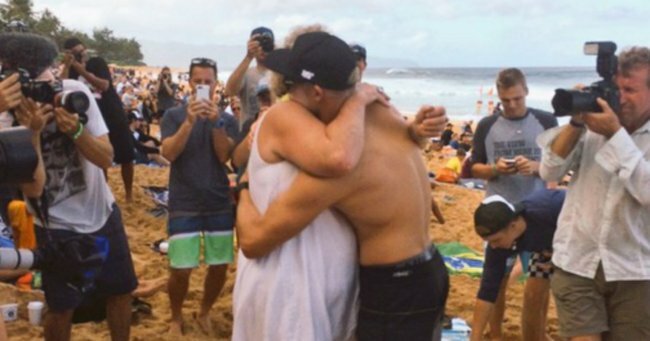 Mick Fanning loses world surf title the day after his brother died. Mick Fanning has narrowly missed out on the 2015 World Champion title. After learning of the death of his brother Peter yesterday, it can’t have been easy for Mick Fanning to get back on his board today but he did and he successfully beat Kelly Slater to advance to the semi-finals of the Pipeline Masters in Hawaii. The world championship title, which would have been his fourth, was within his grasp until earlier this morning when Adriano de Souza triumphed. The Australian surfer told an interviewer that he’s in tears “almost every time he paddles out” after describing yesterday as one “one of the most challenging days of his life” when he learned his elder brother Peter had died. Just as he was preparing to go out on the water yesterday the Australian surfer learned of his brother’s death. Today reports suggest Peter may have died from a drug overdose. Fanning is the youngest of five children, and Peter is the second brother to die too soon. His brother Sean died in a car accident when he was a teenager. His mother Liz, who is in Hawaii for the competition, was watching from the beach as Fanning advanced to the next round. The surfing community has rallied around Fanning in the wake of his brother’s death as he chased his fourth world championship. Fanning described Peter as one of his heroes. “Like all my big brothers, Peter will always be a hero to me. I have so many great memories of the good times we have all spent together and they will be with me forever,” he wrote on Instagram. It’s been a tumultuous year for the sportsman, who was attacked by a shark as he competed in South Africa in July.